STOCKHOLM, Sweden, September 7, 2010 (ENS) – A new way to break down plastic polystyrene debris using micro-organisms and enzymes won two Canadian teenagers the Stockholm Junior Water Prize tonight at a ceremony at World Water Week. Discarded fast food containers, disposable cups, and packing materials enter the environment but there has been no natural, cost-effective way to break them down until now said the International Jury in its citation. “The winning project created a novel approach to break-down these plastics using micro-organisms and enzymes that are cost effective, and readily available. This method could greatly reduce the amount of plastics that end up in the world’s waters,” the jury said. However, plastic blends that include both styrene and polycarbonate plastic containing bisphenol A have been found to improve impact resistance and tensile strength of the resulting plastic. These blends can be used in packaging of consumer goods or in manufacturing of toys, panels, furniture and automotive parts. The World Water Week is the annual meeting place for people concerned about the planet’s most urgent water-related issues. Organized by the Stockholm International Water Institute, SIWI, it brings together 2,500 experts, practitioners, decision makers and business innovators from around the world to exchange ideas, foster new thinking and develop solutions. Two million tons of sewage and industrial and agricultural waste are discharged into the world’s water every day, according to the United Nations. Experts at the World Water Week today considered how to address water pollution and its effect on ecosystems by controlling sources of pollution upstream before the pollutants reach seas and oceans. 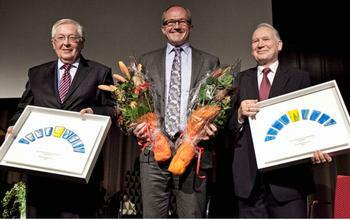 Two Polish scientists who have helped control the flow of polluting nutrients into the Baltic Sea were today presented with the Swedish Baltic Sea Water Award. Currently, the Baltic Sea is at a very vulnerable stage, with about a quarter of its total sea floor area recognized as a variable dead zone with very low oxygen levels. An excess of nutrients encourages oxygen-consuming plants to grow, depleting the sea’s oxygen levels. The 2010 Swedish Baltic Sea Water Award laureates Professor Maciej Nowicki and Professor Marek Gromiec have contributed to Poland’s commitment to modernized sewage treatment, leading to a drop in the concentration of nutrients entering the Baltic Sea. Established in 1999, the Swedish Baltic Sea Water Award honors innovation, commitment and new methods that help protect the Baltic Sea water environment. The award is presented annually by Sweden’s Ministry for Foreign Affairs and is administered by SIWI. The prize sum was increased this year from 100,000 to 250,000 Swedish kroner (US$13,600 to US$34,000) “to further encourage Baltic actors to improve the ecosystem of the sea,” said SIWI. Dr. Rita Colwell of the University of Maryland has been announced as the winner of the $US$150,000 Stockholm Water Prize for 2010. H.M. King Carl XVI Gustaf of Sweden will formally present Dr. Colwell with the prize at a ceremony in Stockholm City Hall on September 9. 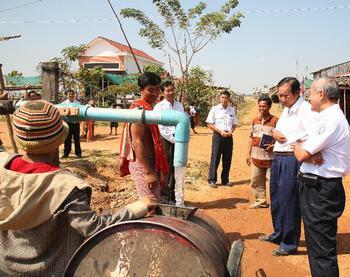 In recognition of its world class performance in water supply and self-sufficiency, the Cambodian Phnom Penh Water Supply Authority, PPWSA, under the leadership of General Director Ek Sonn Chan has been named the winner of the Stockholm Industry Water Award 2010. A city of 1.3 million, the capital of Cambodia Phnom Penh is situated at the confluence of three great rivers – the Mekong, Tonle Sap and Bassac. But decades of conflict left the water supply system running low until 1993 when Chan was appointed PPWSA general director. With his team, Chan has refurbished the supply system and introduced cost-effective billing and payment collection methods. In 1998, the PPWSA provided clean drinking water to all households in the city area. Water losses due to leakages in pipes and pumps declined from 72 percent in 1993 to six percent by 2008. “The PPWSA has successfully fought corruption and shown this can be achieved in a developing country on a large-scale basis using simple but effective management techniques that are based on well-accepted business principles and strategies,” said the International Award Jury in its citation. “As a self-sufficient company, operating without subsidies from the state, PPWSA today provides 24-hour service and 90 percent coverage to a city of 1.3 million and fully recovers its costs as it continues to develop both its infrastructure and management,” the jury said. Despite these encouraging developments, climate change is putting greater pressure on water supplies around the world, warns the International Union for the Conservation of Nature, IUCN. The organization is calling for increased investment in clean water. “Climate change is having a significant impact on the world’s ability to ensure clean and sufficient water supplies for everyone,” says Mark Smith, head of the IUCN’s Water Program. During World Water Week, IUCN is launching the publication “Negotiate – Reaching Agreements over Water,” designed to help decision makers and people working in the water industry to write workable agreements on how to best manage water resources and how to resolve disputes that can arise over water allocation. “Businesses cannot succeed without water. Starting with water use in manufacturing all throughout to supply chain, water is an essential enabler,” said Bjorn Stigson, president of the World Business Council for Sustainable Development. As part of World Water Week, the business organization is convening the 2010 Founders Business Seminar where the upgraded Global Water Tool will be in spotlight. In use by more than 300 corporations worldwide, the tool calculates an organization’s water risk, consumption and efficiency and gives a detailed assessment of a company’s current overall water management.